Join us at the elektro:camp(«2012.05») Workshop on May 4th and 5th 2012 at the University of Applied Sciences Offenburg, Germany! 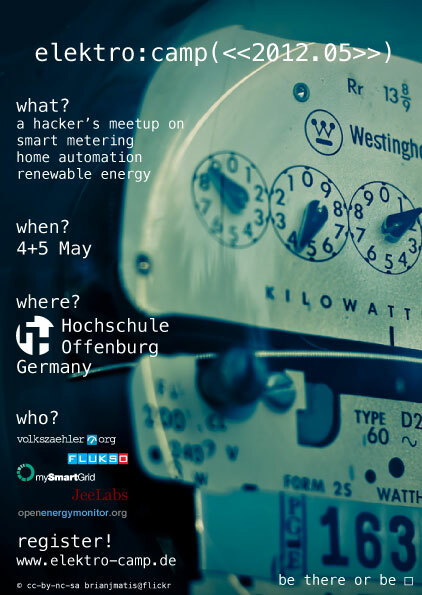 Elektro:Camp is a convention on Smart Metering, Smart Home, Smart Grid and Smart Ideas, in a BarCamp style. This is the fourth meeting of the open source metering community. The concept worked very well at the previous meetings in Kaiserslautern (October 2010), Stuttgart (May 2011) and Groningen (November 2011). You're here for the first time? To get a first impression of the previous Camp you might want to give the proceedings a look or two. You can travel to Offenburg by train. The ICE stops in Offenburg. You can take a bus to “Hochschule, Offenburg” (Line S8, direction “Hildboltsweier”). OpenEnergyMonitor Slides - copy of the presentation slides shown by Glyn Hudson and Trystan Lea.